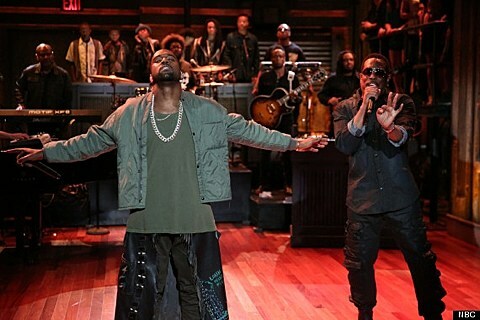 Kanye West recently announced a tour with Kendrick Lamar, and following that announcement he appeared on Late NIght with Jimmy Fallon to perform the closing track on Yeezus, “Bound 2.” Kanye performed with backing from Fallon’s house band The Roots, a choir doing the “bound to fall in love” vocal and Charlie Wilson joining him to sing his hook on the song. Check out the video of that performance below. As discussed, Kanye’s tour hits NYC on November 19 at Barclays Center and November 23 at Madison Square Garden. Tickets for both shows go on AEG/Venue/Radio/TM/Twitter/AmEx presales Thursday (9/12) at 10 AM (password: “YEEZUS”). General on-sale begins Friday (9/13) at 9 AM. Kendrick, who we just caught at Williamsburg Park, hasn’t been announced for the NYC shows (neither has anyone else).